Posaconazole15 (21) is a novel triazole that has broad-spectrum antifungal activity against Aspergillus spp., Cryptococcus spp., Histoplasma spp., and a variety of other pathogens. In the clinic, posaconazole has been found to be well tolerated, with common side effects being gastrointestinal in origin. 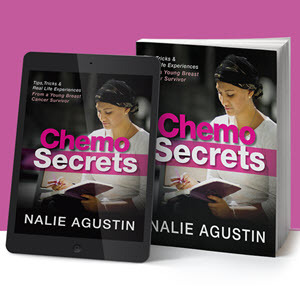 Life-threatening opportunistic fungal infections occur in AIDS patients, and also in patients undergoing chemotherapy for cancer, or those who have undergone organ transplants. The older antifungals do not work well with these patients, and the use of amphotericin B, a broad-spectrum antifungal, is limited in its use by its inherent toxicity. Posaconazole has been demonstrated in extensive clinical trials to be a potent orally active antifungal agent that works very well in the above-mentioned patient population. Based on the above observations, Schering-Plough has submitted a New Drug Application to the FDA, and is waiting for its approval to use posaconazole in the clinic. It has been established for a long time that 'azoles'16 (i.e., fluconazole17 (22), ketoconazole (23), itraconazole (24), and saperconazole (25)) work as antifungals by inhibiting the biosynthesis of ergosterol using fungal cytochrome P450 enzyme lanosterol 14a-demethylase. Ergosterol is an essential component of the fungal cell membrane, and therefore inhibiting its synthesis will prevent the fungus growing. It is imperative for the above process to be selective over mammalian cytochrome P450, to avoid toxic side effects. Fluconazole (22) is orally active, and is very widely used against Candida and Cryptococcus infections; however, it lacks activity against the important pathogen Aspergillus. Ketoconazole (23) was the first example of an orally active antifungal used in the clinic, but exhibits hepatotoxicity and also interferes with testosterone biosynthesis. Itraconazole18 (24) is an orally active broad-spectrum antifungal that shows activity against Aspergillus. Our aim at the SPRI was to discover an orally active antifungal, comparable to fluconazole (22) in its activity against Candida and also having activity against fluconazole-resistant strains of Candida glabrata and Candida krusei. In addition, our compound should have activity against Aspergillus, and should be superior to itraconazole (24), be safe, and not be an inducer of human cytochrome P450 enzymes. 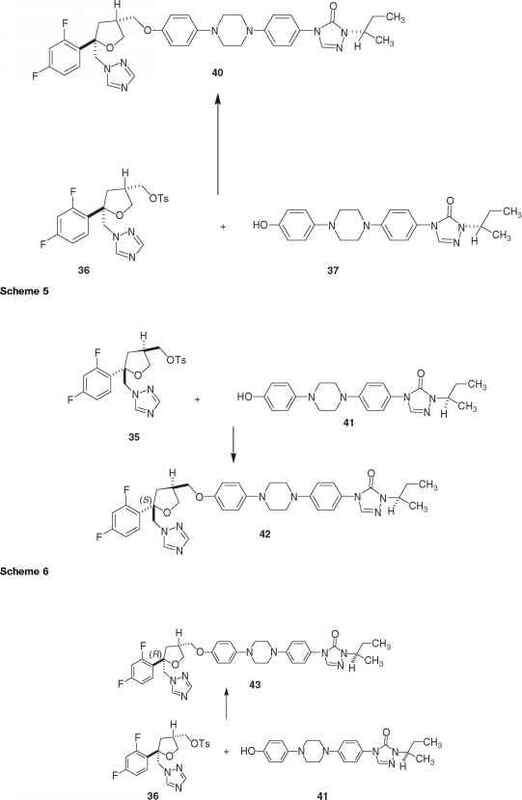 As has been pointed out already, it will be important to have an azole moiety in our new antifungal; however, it should not have the 1:3-dioxolane ring system present in the structures of 23, 24, and 25, because it is expected that such a ring system might induce instability of the drug under the acidic conditions in the stomach. Thus, we wished to explore whether other oxygen-containing heterocycles represented by 26, 27, 28, 29, and 30 will possess activities of interest. We have synthesized19 all these novel structures with appropriate R groups in the racemic form, and determined their activities, and the results are as follows: 26, 27, and 28 were more active than 23 and 24, and, among these compounds, 27 was the most active. In this chapter we focus on the synthesis of this class of compounds that led to the discovery of posaconazole (21). In our initial studies the importance of the aromatic spacer group -OR, and the presence of an azole moiety for its broad-spectrum activity, potency, and oral bioavailability, became apparent. Among the initial compounds synthesized, SCH 450 1 2 (31)20 was more active than itraconazole (24) and saperconazole (25) against systemic Candida and pulmonary Aspergillus infection models. SCH 45102 has three chiral centers, two of which have an established cis stereochemical relationship, and therefore it presents as a mixture of four optical isomers. Using Sharpless oxidation the chiral epoxides 32 and 33 were prepared from the allylic alcohol 34 (Scheme 3). Enantiomerically pure 32 and 33 were converted to the tosylates 35 and 36, respectively, as described in our earlier publication. The reaction of 35 with 37 gave SCH 49999 (38) (Scheme 4), whereas the reaction of 36 with 37 yielded SCH 50002 (40) (Scheme 5). Alternatively, when 35 was treated with 41 it yielded SCH 50000 (42) (Scheme 6), and 36 on treatment with 41 yielded SCH 50001 (43) (Scheme 7). The phenol 37 was prepared by reacting 44 with the enantiomerically pure tosylate 45, followed by O-demethylation (Scheme 8). Similarly, 41 was prepared by reacting 44 with the enantiomerically pure tosylate 46, followed by O-demethylation (Scheme 8). is no other way at the outset to know which stereoisomer will be of importance. SCH 50001 and SCH 50002 being equiactive also suggests that the stereochemistry of the side chain is not important. With this information in hand, we synthesized SCH 51048 (47),21 following similar schemes as used for the synthesis of SCH 50001 and SCH 50002, thus eliminating one asymmetric center, which of course makes the synthesis much simpler. SCH 51048 was much more potent than either SCH 50001 or SCH 50002, and also had a much broader spectrum of activity as an antifungal. Thus, eliminating one asymmetric center in SCH 51048 resulted in a compound that was more active and easier to synthesize. The Friedel-Crafts reaction of 2,4-difluorobenzene with succinic anhydride yielded the ketoacid 48, which was converted in Wittig reaction to the olefin 49 (Scheme 9). Stereoselective hydroxymethylation of 50 obtained from 49 yielded 51. Iodocyclization of 51 yielded 52, which on reduction with lithium borohydride yielded the alcohol 53. Displacement of the iodo compound with sodium triazole followed by tosylation yielded 39. The synthesis of SCH 51048 was completed by reacting 39 with the phenol 54. During in vivo studies it was found that SCH 51048 produced an active metabolite, and it was concluded from mass spectrometry studies that the metabolic hydroxylation occurred at one of the carbons in the side chain of SCH 51048. As hydroxylation of the tertiary center will produce an unstable compound, the metabolic hydroxylation must have occurred either at the primary (two isomers) or secondary carbon (four isomers) center. We synthesized all the possible isomers, and determined their activities. Based on their spectrum of activity, potency, and pharmacokinetic properties, posaconazole (21) was selected as a clinical candidate. The synthesis of posaconazole was achieved by reacting 36 with the phenol 55 followed by deprotection of the alcohol protecting group. Compound 55 was prepared by O-demethylation of 56, which in turn was prepared by reacting 44 with 57 (Scheme 10). Compound 57 was derived from (S)-lactic acid. Posaconazole was tested against 285 strains of yeasts and filamentous fungi comprising 37 different species of fungi, including fluconazole-sensitive and -resistant strains of Candida, and also against Aspergillus. The mean minimum inhibitory concentration (MIC) against Candida was 0.018 mgmL~ \ and that against Asperigillus was 0.048 mgmL~ \ These MIC values are superior when compared with other clinically used antifungals. It has already been pointed out in this chapter that posaconazole was found in the clinic to be safe and efficacious as an antifungal - it is active against Candida and, particularly, serious infections caused by Aspergillus. 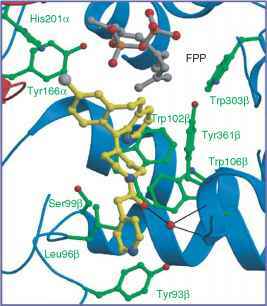 possible approaches, we ' and others decided to attempt to discover an anticancer agent that would work by inhibiting the enzyme FPT. 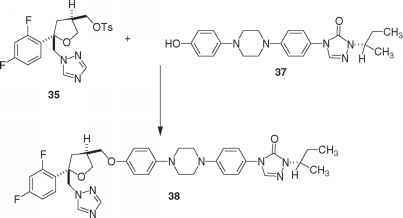 In this chapter we discuss the path we took to the discovery of lonafarnib (58), a potent inhibitor of FPT, and discuss its anticancer activity. It was well documented28 at the outset of our work that approximately 30% of all human tumors contained a mutated Ras protein. Three mammalian Ras genes (i.e., H, K, and N), with mutations at positions 12, 13, and 61, have been identified in these tumors. Each of these genes encodes closely related proteins known as Ras P-21 proteins, containing 189 amino acids. Ras proteins undergo a series of post-translational modifications before attaching to the cell membrane. In the 'off' state the modified Ras protein is bound to guanosine diphosphate (GDP); however, during cell activation, Ras-GDP is exchanged to the guanosine triphosphate form (Ras-GTP). In the normal cellular process, Ras-GTP (the 'on' state) is hydrolyzed by a GTPase (GTP-activating protein) to Ras-GDP, and cellular function returns to the 'off' state. However, in cancer cells the above hydrolysis step is much slower, and cellular proliferation continues in an uncontrolled manner. At the C-terminus of the Ras protein there is a CAAX sequence (where C is cysteine, A is an aliphatic amino acid, and X is a variable such as methionine). However, when X is leucine the protein becomes geranyl geranylated, which is a more common event in a normal cellular process, and it uses a related enzyme called geranyl geranyl protein transferase (GGPT). It is therefore important that a desirable FPT inhibitor should be selective over GGPT to avoid potential toxicity problems. The post-translation modification29,30 of the RAS protein involves modification of the CAAX box using the following steps: (1) farnesylation of the cysteine residue using FPT, (2) cleavage of the CA bond using Ras-converting enzyme, and (c) methylation of the newly generated carboxylic acid group using carboxymethyl transferase. Thus, the transformed Ras protein; attaches to the cell membrane. It should be noted that selective inhibition of any of the above three steps will provide an anticancer agent. 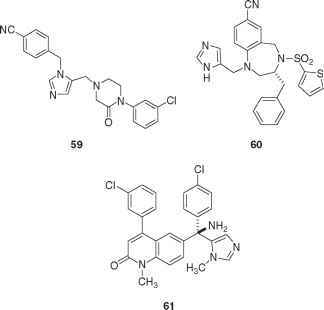 Several different approaches have been taken in different laboratories to discover potent inhibitors of FPT, and as a result four compounds have entered clinical trials: L-778123 (Merck)25 (59), BMS-214662 (Bristol Meyers-Squibb)26 (60), R-115777 (Janssen)27 (61), and lonafarnib (Schering-Plough)23,24 (58). In this chapter we focus on the discovery of lonafarnib. The discovery of lonafarnib began with the screening of SPRI compound libraries. Several tricycles, including compounds 62, 63, and 64, were found to possess weak to moderate activity against FPT, and these compounds had selectivity over GGPT; however, they showed poor cellular activity (Figure 8). Following the above leads, several amides were prepared. In Table 3, the activities of a few of these amides are summarized to highlight structure-activity relationships. SCH 4434231'32 was one of the most active analogs synthesized. Ganguly, A. K.; Doll, R. J.; Girijavallabhan, V. M.
Reprinted with permission from Ganguly, A. K.; Doll, R. J.; Girijavallabhan, V. M. Curr. Med. Chem. 2001, 8, 1421 © Bentham Science Publishers Ltd. Figure 9 A change in position of the pyridine nitrogen or from ring cleavage results in inactivity. an inhibitor bound to FPTwas available, and we shall return to this point later. When the spacer group was increased in length, the resulting compounds were inactive. We also found that when the position of the pyridine nitrogen atom was changed, or when the rings B and D were cleaved, the resulting compounds were essentially inactive (Figure 9). FPT is an obligatory dimer composed of a and b subunits. The crystal structure of unliganded FPT shows that the a unit is composed of seven pairs of anti-parallel a helices packed to form a crescent shape. The six pairs of helices in the b subunit are arranged as a double-walled barrrel. The active site cavity is situated near the center of the protein, and lined with residues of both the subunits. The catalytic zinc is liganded by three side chains arising from the b subunit, and a water molecule occupies the fourth site. An x-ray crystallographic study33 of SCH 44342 bound to FPT (Figure 10) demonstrated an extended interaction between SCH 44342 and FPT. SCH 44342 binds in the center of the active site cavity, and the tricyclic ring A-B-C is situated deep in the cavity, and fits well in the lipophilic pocket and near the farnesyl pyrophosphate residue. Ring E is closest to the molecular surface. In three dimensions, the tricyclic ring is at a right angle to the rest of the molecule. The pyridine nitrogen atom is hydrogen bonded to a water molecule, which in turn is hydrogen bonded to the Ser99b residue. Aromatic rings A and C stack against the aromatic amino acid residues of the a and b subunits. One of the most important interactions involves the hydrogen bonding of the amide carbonyl with a water molecule, which is hydrogen bonded in turn to the Phe360b and Tyr361b residues of the protein backbone. It was also clear from x-ray studies that a few more interactions could be gained in SCH 44342 if there was a substituent at the 3-position of the pyridine ring. Thus, a number of analogs with different substituents at the 3-position (Br, Cl, F and CH3) were synthesized, and their activities are summarized in Table 4. Although 74 was highly active, as the methyl group is expected to undergo metabolic oxidation we decided to substitute bromine at the 3-position in ring A for the synthesis of future analogs.